I have been aware of them for years but quite skeptical about their role in the average gym-goers workout. To me, kettlebell training was obviously risky for the shoulders and back and the bouncing and locking in your hip and knee joints that is required to perform the form is…against everything I know about form! So for years I have been anti-kettlebell. Recently I was lured into giving this old-school strength training technique another shot by promises of serious calorie burn, quick workouts, and full-body exercises. I bought a kettlebell and some dvd’s. Kettlebells can be really expensive but I totally cheaped out and bought the department store variety. It’s girly and pastel, not at all cannonball-like :). It turns out that 10 pounds is just right for one-armed moves and a little light for two armed moves for me. I admit, I’ve only used the kettlebell 4 or 5 times since I gifted myself with it around Christmas so it’s impossible to say if I’ve seen results. The dvd’s are great, they give good descriptions for posture and technique and provide good workouts but I still felt like I was missing some vital keys in technique. I thought that the only kettlebell training available at the gym was in conjunction with a cycle class. I don’t cycle. Maybe I will someday but for now I don’t cycle. I was thrilled to discover a kettle conditioning class tucked up in the corner of the Thursday morning group exercise schedule. This morning I got my tush out of bed and went. The class was hard and good. My heart rate was seriously elevated for only about 10 minutes of the hour class but my muscles were quaking by the end. On the teachers recommendation I used 15 and 20 pound bells (mostly 15!) but I think a 10 pounder would have been more appropriate for some exercises. I continue to have mixed feelings about the safety of kettlebell training. The bouncing and locking into the leg joints is less scary and treacherous than I previously thought, unless you hyper-extend your knees (which I don’t). I still have serious concerns about shoulder and back overuse issues. By the end of class my low back hurt! My low back rarely hurts, which I attribute to regular Pilates workouts and good alignment/posture. It doesn’t feel like I strained anything, just like I overused it. Not to toot my own horn, but I have very good form and I am strong. I was keeping a long back with engaged abs the entire time and my back still feels yucky. My conclusion is that 60 minutes is way too long for a newbie to kettlebell training. The gym should offer a 30-45 minute intro class to build up strength and practice form. I can only imagine how rough I would be feeling if I was “de-conditioned” and decided to jump into that class. OW! My stand on kettlebells at this point is that they are a fantastic tool that I will continue to incorporate into my regular workouts but as a trainer and teacher I think it is crucial to take the time to build your technique and strength up slowly. And stop doing it if it bugs my back or shoulders! I have a lot of the same feelings as you do. And I have the same video! I think it can be a great workout, but I’ve never done it in a class. 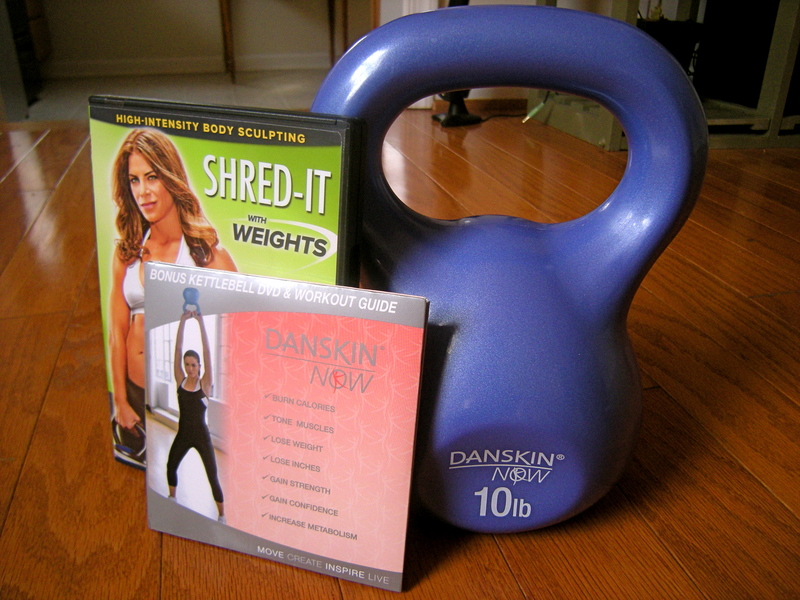 I’ve really wondered how safe it is for a fitness newbie to pick up solo at home…? Love the LaLanne quote from a few posts ago! My point exactly, kettlebells are an advanced piece of equipment and one with serious risks if not done correctly! What size bell do you have at home? I bought a kettlebell as a “present” to myself at the beginning of this year. I haven’t touched it, except to unpack it. The only DVD/instruction I have for it is what came with it. I am a *complete newbie* when it comes to kettlebells, and really don’t have a clue where to start. Of course, it doesn’t help that for the past couple weeks I’ve been battling illness and related back pain. So definitely not going to attempt it until I am all better in that area! I’ve used a kettle bell before during a workout, however, it wasn’t the only piece of equipment I was using throughout the duration of it. In the times I’ve used one, it was during a 1-hour session and I probably only used it for 3 moves, which I probably prefer. I know you can use it for a lot of moves, but I feel like if I was to use to heavy of one, I might swing myself in the face of hurt my wrists because they’re kind of awkward to hold onto and maneuver. Thanks for doing this review though! I had kind of forgotten about them until I read this, so maybe I’ll try and reincorporate it into my routine. I’ve had the same thoughts about kettle bells. When i see people using them incorrectly or with poor form I get so scared for them! I’m loving your blog and it’s a great inspiration for my own (new) one!! Thanks so much. Our gym has Kettlebell classes twice a week, but before you can attend the classes, you are required to attend an intro class (held according to demand) to get the posture and moves down. I think that should be mandatory anywhere kettlebell training is taught! Have you done it? No!!! I’m still scared! And right now I’m doing TRX twice a week, I can’t handle another muscle burning routine! faith, KB training is a staple of crossfit! they are incredible for your entire body but definitely require some instruction and orientation before using them . I encourage you to go to free saturday morning class crossfit charlottesville . when we move back we can work out together there 🙂 hope you’re well! I’ve been eyeing the crossfit gym and think of you each time! I will definitely go when you return and maybe before, when are you coming back?! Great to hear from you and I hope CO is treating you well! I share some of your concerns but have been wanting my own kettlebell for a long time. Jillian M. has an adjustable weight one! I also have good form & am strong ;), so I feel this is great to incorporate but not over do it. I like using it for breathing ladders. I REALLY WANT MY OWN. 🙁 I should just splurge already. Get you one! It will last forever, especially if you get an old school cannonball one (although Jillian’s is pretty sweet looking). Great blog and congrats on your new business! My husband and I started doing kettlebells over 6 months ago and I have really enjoyed them, but more as a strength training workout instead of cardio. We used the dvd that came with the kettlebell and some youtube videos to get the form down and then bought a series called Kettleworx- I highly recommend these. They are 20 minutes long and are great, especially the core ones. I run 3 mi 5-6 days a week and do these videos at least 2 times a week and have enjoyed the results. Thanks for the input, I am excited to check out Kettleworx.